The winner of Gabi's book is: Daria Drake. Congrats, Daria! Send me your contact information and I'll pass it along to Gabi. Thanks to everyone who participated. How many times have you played the game “What if”? My favorite version: If you could choose a magical and or superpower, what would it be? My answers always varied depending on my age. I know which powers I wouldn’t want. I would hate to be able to read minds. I don’t want to know what people are actually thinking about me. I know, I know, there are situations where mind reading would be handy, but for me the negatives outweigh the positives. I think the ability to fly would be cool. But I can’t imagine it would be easier to fly than say to jog. In my logic, I can’t believe powers would come without a cost. In fact in my book THE WISH LIST, all magic requires energy, and if a wizard overuses his powers he can harm himself. Flying would probably be as hard as running, and I’m not a big fan of exercise (I know it’s good for me and I do it, but I don’t enjoy it. It never has the effect on me that it’s supposed to. I’ve never felt energized by it.) Besides, it’s cold in the atmosphere, and I hate being cold. Being invisible is another one. But there’s a sneakiness and underhandedness about being invisible that bothers me. It’s like eavesdropping. It’s rude. Sometimes manners do count. And I’ve always had the perception that people don’t see me anyway (Yeah, we writers are neurotic). I don’t need to aide that perception. Super strength? That could be fun, but I’d be afraid I’d hurt someone. Stopping time? Interesting, but messing with time causes problems I’d rather not deal with (do I keep aging while the rest of the world stops?). Teleporting? Now that I like, but I’d bet I’d be on everyone’s watch list. Telling the future? No thanks. I’d rather be surprised. Transformation? OK, I confess, I’d like to be able to change in to a dolphin for a while and swim, but I’m sure I’m underestimating the dangers I’d face. Let’s face it: I’m a chicken and a pessimist. No, I’m really not a pessimist. I believe in happy endings, that most people are good, that we do have a future, and that life is fun. The magic I want most in my life is the ability to tell a story. When I sit down at the computer or with a piece of paper (Yes, I do still write on paper occasionally) and the words flow and the story reveals itself, that’s what I call real magic. When a twist occurs that I hadn’t foreseen, even though I’m the author, that’s real magic. And when I’m holding my novel in my hands, a real book, that’s magic. So tell me? If you could choose a magical and or superpower, what would it be? 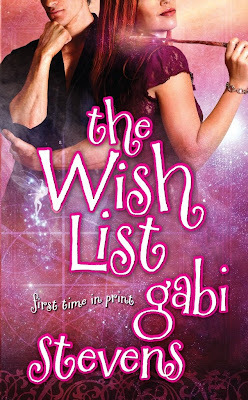 Gabi Stevens’s latest book is THE WISH LIST. In it, she gives her characters the magic she doesn’t actually have herself. When Kristin Montgomery discovers her three aunts are fairy godmothers and she’s next in line for the job, her orderly world disappears like magic. No, not like magic; it is magic. Not only does she have to deal with burgeoning powers, she also encounters a surly arbiter, a sarcastic sprite, and a suave French sorcerer. And one of them is the bad guy. You can find it on line or at a bookstore near you. Visit Gabi’s web site at http://www.gabistevens.com/. Gabi will be giving away a copy of her book (and some fairy dust) to one commenter. Her winner will be selected and posted on Tuesday evening. Stop back by to see if you won. This sounds like a fun book! I love the idea of the aunts being fairy godmothers. Well, I would like to have the ability to use magic for things like making dinner, cleaning the house, doing the laundry and getting rid of the mundane stuff like that. Teleporation/flying would be my choice but dang it, it would be hard to stay at work I'd be traveling all over lol. I would love to have a fairy godmother to help out when needed. Super speed would be great at times to enable all the jobs getting done at home and work. This book sounds so good, I can't wait to read it! Thanks for the contest. I hope you all do find it fun. That was my intention. Although not a comedy, I try to inject humor into all my books. I believe a day without laughing is wasted. And as I'm working through this crazy week (I have a lot on my schedule this week), I'm thinking maybe the ability to stop time might come in handy. Oh I would absolutely LOVE to be able to move things with my mind. I think that'd be LOTS of fun! Oh wow, I would love super strength (combined naturally with indestructability). Effortless exercise. My kind of work out, baby! Great post, you! It makes me feel all creative inside. i've been eyeing this book since the first interview around the blogs ! Your book sounds great! I enjoyed your post, a special ability sounds fun, but my mother always warned me...be careful what you wish for you might just get it. You guys have so many neat ideas for powers. Stuff I never even thought of. Sounds like a great book. Very entertaining. My choice would be teleportation. It would be awesome to not have to spend time traveling. That was a fun interview to read. :D If I had to choose a super power I would want classic super strength! I'd like to be a time traveler, so I could go back and find out what life in all those poorly-documented eras of human civilization were really like! I guess I'd better also hope I have the superpower of learning any language FAST if I want to be able to blend in...either that or get someone whose superpower involves the invention of amazing gadgets to create a universal translator for me.